This week, I saw a black kite for the first time soaring high above the ground, so that’s what I want to write about today. These beautiful birds grow up to 60 cm long. Despite their name, they aren’t actually black, although they can look black from a distance. They are really dark brown with some lighter markings. What they eat depends on where they live, but they mainly eat carrion, birds, bats, fish and small mammals. They are often seen near fires, where they catch bugs and other small animals escaping from the flames. In the large cities of India, they get a lot of their food from rubbish tips and even steal food out of the hands of people. Unlike most other raptors, black kites can form large flocks, especially during plagues of grasshoppers, when hunting near fires or when migrating large distances. Black kites are the most populous species of raptor, with about 6 million in the world. They are found throughout Europe, Asia, Africa and Australia. 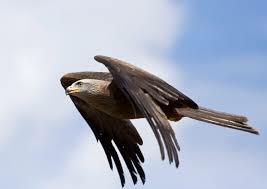 Are there any other interesting facts that you would like to share about black kites?